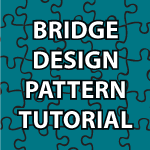 Welcome to my Bridge Design Pattern tutorial. If you ever wanted to build a group of classes that slowly added functionality from one class to the next, this is the design pattern for you. There seems to be a lot of confusion in regards to what constitutes a bridge design pattern in both books as well as online. In this tutorial I will show you how it was explained to me and the ways in which I have found it is useful. The code after the video goes into greater detail if you’d like to check that out. Nice Tutorial. Is this pattern main theme to teach how to use abstraction properly or is their more to it than what you have discussed. PLease I would like to know if this remote controller that you’ve created is like the universal remote controller in the real world (I mean the one that can work with any type of equipments ) ?. an other question please . Don’t you think that this should rather be called an aggregation instead of composition . Sorry for being too long . Thank youu so much , and please keep it up ! I really appreciate each of your videos. Thank you for all the effort that you have put in. Nice way to explain Bridge pattern. However, I just have 2 points to make, and would appreciate your thoughts. 1) In example above, I find it difficult to digest that I can create a TVRemote and can pass it a DVDDevice. The code will still work. So shouldn’t the constructor be changed so that a TVRemote can only take in a TVDevice, and similarly for the DVDRemote. 2) Would it perhaps make the example slightly better if we did this instead? You extend the EntertainmentDevice to create TVDevice. Every TVDevice provides functionality of muting and pausing. Then you create specific Remotes to choose what the button nine does. So for a tvRemotePause.buttonNinePressed() will actually call the device.pause(), and tvRemoteMute.buttonNinePressed() will call the device.mute(). This said, I really appreciate your effort. Nicely done! :). man!! thanks so so much. i am a university student, had a Design patterns course unit this semester, and your tutorials have helped me a great deal. Great video! My respect for you increases with each video I see. Simply tremendous! One request though, if you could provide diagrams like those given for Abstract Factory and Factory method Patterns, it would greatly help us to visualise the patterns and grasp the code more quickly. Thank you very much for the kind message. I’ll see if I can get a diagram for the bridge pattern. Thank you very much for this tutorial, the concept of brigde is getting clearer. I have a question in DVDRemote there is an attribute “play”, it is not clear to me why would a Remote have “play” instead should it be in the Device? Assuming “play” would instead be in the EntertainmentDevice. Thank you for training video its very helpful and your previous replies too. I do not understand what does “abstraction” mean ? Can you help me . Basically by abstracting we try to keep the user from needing to understand the details. So here we have a remote control. So, if they want to have something different occur when button 9 is pressed for example they just extend RemoteButton and define a new buttonNinePressed method and it will just work. Good code can be changed without breaking, or without needing to change anything else. Abstraction helps us do that. i hope that helps. First of all I want to tell you that I really like your tutorials, they’ve been very helpful to me, you are brilliant. I have a little question about the bridge pattern and the remote example, I don’t know if I’m missing something, but shouldn’t the remote interface has all the methods in the entertainmentDevice class?!!! I mean what if I want to press the seven and eight buttons using a TVRemoteMute object? instead of a more general RemoteMute and a RemotePause? of the pattern must also be correct – I just don’t understand why to limit a pattern, if it could be so much more dynamic, the other way round. (And I am sure, if I didn’t get that part, I didn’t get the true entire meaning of the pattern either). p.s. Thinking about it, I guess I have done something like the Strategy-Pattern – However this knowledge still does not answer my question (then I could define the question as- of why I would use the Bridge Pattern istead of the Strategy-Pattern). Last but not least – it’s said (Internet, Head First book) the bridge pattern would separate Abstraction from it’s implementation – well thinking of abstraction and implementation, I would think of something like “AbstractCar and concrete BMW extends AbstractCar” – however (in your bridge-pattern example) – the abstraction is like a real-world-abstraction – a remote control ABSTRACTS the use of the TV, but a remote control is not an abstraction of a TV. ?????? sorry, I am really confused now… ?????? Patterns confuse everyone in the beginning. The strategy pattern is used when you have many ways of doing one thing. It also allows you to decide how to do them at runtime. In my tutorial on it I show how we can change the flying abilities of an animal at runtime. The bridge pattern allows me to add additional functionality easily. Here I have a remote that can easily be changed to work with not only tvs, but any other type of electronics device. well, from what I’ve found out so far, the bridge pattern and the strategy pattern actually are / seem to be the exact same pattern, the very few comments about it I found on internet forums say it would depend on the context / motivation of what is actually required – if you want to replace functionality at runtime – it’s called the strategy pattern, if you want to separate implementation and interface, it’s the bridge pattern. However it’s still not 100% clear to me why this would justify two distinct names for technically the same thing. Hmmmm.